Also, since Plaxo has a couple million monthly visitors and therefore a couple million data points, statistically speaking these numbers are relatively accurate. Without further ado, here is the data, with some spiffy charts. Some numbers here have a value of 0.00% which means they've been rounded down and have really low numbers. The order is still correct though. Internet Explorer is doing remarkably well – it is still most definitely the primary browser, so testing it should be planned accordingly. 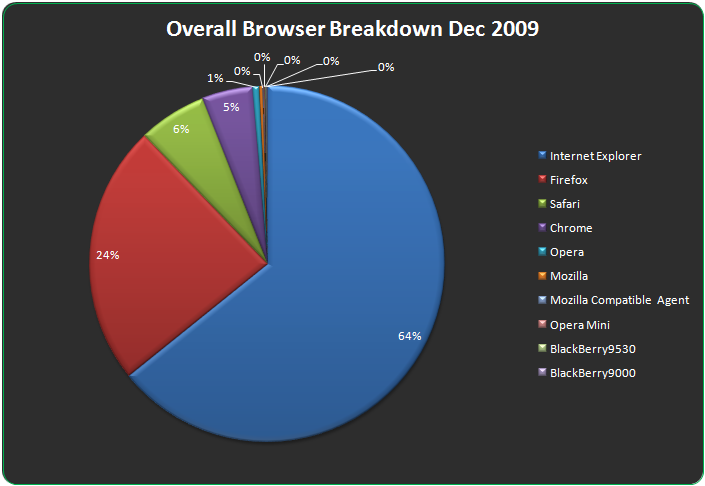 Internet Explorer 7 is by far the most popular version with 65.9% of all IE versions, followed by IE6 at 17.2% (wtf?? ), and only then IE8 at 16.9%. This definitely came as a surprise to me – both in how popular IE7 still is and how pathetic Microsoft's efforts to upgrade Windows users up from IE6 have been. Safari and Chrome are neck and neck at 6.20% and 4.6% respectively, with Chrome gaining rapidly. Opera is doing undeservedly badly – 0.6%. That makes me sad. IE 999.1? Interesting. I wonder if it's some sort of an uber hacked version. And, instead of conclusion: damn you, IE6! Why can't you die already?
. : 82 queries :. : 0.101 seconds to generate cache :. : nexus2 :.